We run the Pink Ribbon Program, a specialist programme dedicated to breast cancer rehabilitation. Our studio founder Ismini Phillips is one of the few Breast Cancer Exercise Specialists (BCES) in the country. The Pink Ribbon Program is designed to help anyone who has been through breast cancer surgery. You can start quickly. Begin the programme just 2-3 weeks after you have been discharged from hospital, or as soon as you feel well enough. This approach makes the Pink Ribbon Program unique. It’s suitable for men and women. Men affected by breast cancer can also benefit from our tailored exercise programme. Everyone will always be made to feel welcome. It is run by a BCES. Ismini Phillips has undergone extensive training and is qualified to write exercise programmes and make recommendations that will work for you. It allows you to work where you are comfortable. Your BCES will take into account whatever surgery or treatment you have undergone when deciding how you should work. Muscle tone and strength. Our exercise programme has tangible results and you will notice a difference in the way your body looks and feels, particularly if you haven’t been able to exercise for a while. Greater flexibility. Pilates improves flexibility in your joints and muscles, helping you move more easily and improving posture. It’s incredibly freeing, especially after hospital stays and post-surgery rest. Feel more confident. Exercise is great for the body and the mind, getting endorphins flowing to give you a natural boost. Regain confidence in your body and its capabilities. Take control. The programme is an empowering experience, especially after the lack of control you can feel during cancer diagnosis and treatment. Take charge of your health and body once again. Improves arm and shoulder strength and mobility. Following a mastectomy, lumpectomy, or node removal, the functionality of the shoulder girdle is affected. All the muscles of the shoulder girdle are disturbed, some are taken out, and it affects how this whole area is held. The sooner we get to work, the better, helping to regain strength and mobility in all affected areas. Helps rebuild muscle after a reconstruction. Reconstruction surgery following a mastectomy can affect various parts of your body, depending on where tissue has been removed. Pilates exercise works on general strength and toning to help your muscles rebuild themselves and recover. We can adapt all exercises to make them suitable for you after surgery. What is it like to take a breast cancer rehabilitation programme with us? A gentle approach. We get it – exercise might be the last thing you feel like doing after breast cancer surgery. Please don’t worry. 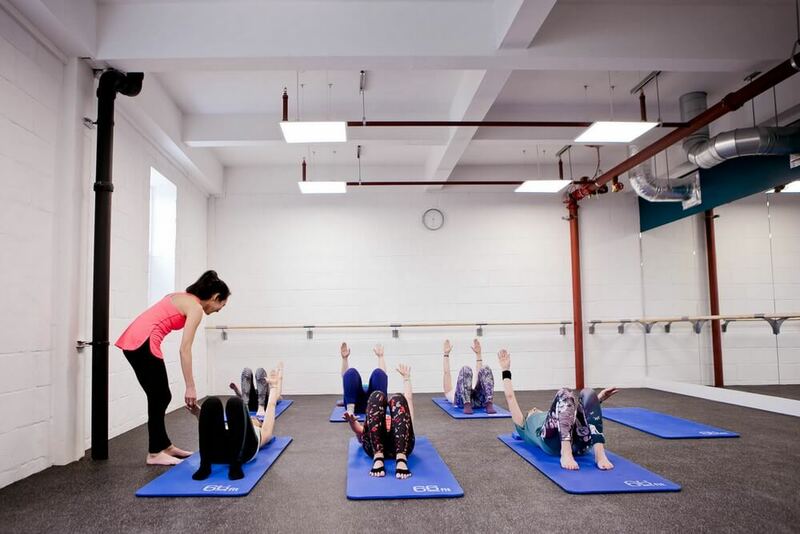 Our programmes are flexible and supportive, working to offer you the skills you need to get your body back up and running. Lifelong support. Breast cancer recovery is a lifelong commitment. As soon as you stop exercising, scar tissue will begin to tighten, becoming uncomfortable and limiting movement. We equip you with the skills to make lifestyle changes and live life to its fullest. Ongoing Pilates skills. Many people enjoy Pilates and want to keep learning. Once you have completed the Pink Ribbon Program, you can attend one of our beginner, intermediate or advanced Pilates classes, depending on the previous experience you have. The Pink Ribbon Program runs in three phases over a 13-week period. You will generally be working in a small group, so you will receive individual guidance as well as moral support. We run the programme at various times throughout the year, so please get in touch to find out more and enquire about our next start date.